Which MGB model to buy? The MGB was produced for 17 years and underwent many changes during its lifetime. Models years 1963 to 1969 look largely identical with chrome bumpers and grille, often with wire wheels and a spoked steering wheel. The "Leylandized" MGB was introduced for 1970 with a black recessed grille and "Rostyle" wheels, but was replaced in 1973 with a more traditional chrome grille around a black plastic mesh. Safety regulations in the United States forced MG to fit large impact-resistant bumpers and raise the ride height only two years later, halfway through the 1974 model year. This marks the transition from "chrome bumper" (CB) to "rubber bumper" (RB), the most noticable design change in the MGB's long production run. For a more detailed history of the MGB, read the "Evolution of the MGB" article in the Library, and for a really in depth study, get Original MGB by Clausager which is required reading anyway for any serious MGB owner. More essential reading and reference material can be found in the MG Experience Book Store, which are useful before buying your MGB and indispensible once you own it. Next, to decide what kind of MGB you want to own, look at lots of pictures. Discover which style you like best, and go hunting. Every model has its own (endearing) idiosyncrasies and die-hard fans. Check out the MG Experience Registry for a huge collection of MGB photos in all kinds of trim levels, paint colors, and interiors. The Registry also contains many MGs for sale around the world. 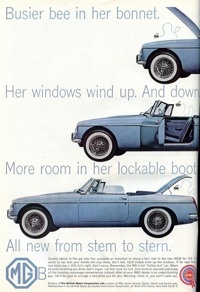 Is the MGB the right car for you? Well, only you can answer that question. They are simple cars and if you have some basic car knowlege you can do most of the maintenance yourself. If you don't have basic car knowlege, well here's your chance! It's very rewarding to work on your own vehicle. However if you are "mechanically challenged" there are lots of British car shops that would be happy to change the oil, grease, etc for you. Just make sure to take it in when the service schedule says its time, and get the oil changed religiously. Treat the car well and it will run for a long, long time. Prospective buyers have often expressed concern about the reliability of MGBs. There seems to be a misconception, someone heard from someone's uncle's friend that their MGB was a lemon. Unfortunately, there are a lot of MGBs out there that have been neglected, and that coupled with the fact that they are between 40 to 50 years old (and counting) at this point means that some will break down more often than others. The reality is, they are very simple cars and will give plenty of advance warning of most problems, at which point you should get the cause (not the symptom) fixed. If you want to drive a roadster from point A to point B in modern comfort and not give the car a second thought, get a Miata. If you want a car that oozes character and style, and you don't mind getting a little dirt under your fingernails, get an MGB. You will find you develop an "ear" for the MGB very quickly, which will alert you when something's not quite right. Part of the charm of owning an MGB, in my opinion, is in this relationship. Developing a mechanical sympathy with your car can increase your enjoyment. I would also like to add that Lucas electrical systems are no less reliable that any other electrics I have had experience with, taking their age into consideration. Again, the electrical system is simple, and easy to diagnose with a test light or multimeter. If you want the best 'B for your money, pay top attention to the condition of the body. A bodyshell with messed up mechanicals and perfect body is many many times cheaper to restore than a rusty shell that drives - a full body restoration can often cost 10 times as much as an engine rebuild. MG parts are cheap, the only "classic" import car with more spares available would probably be the VW Beetle. Nothing kills a car like sitting around! If the car has been parked for more than a couple of years, be wary. Sitting rots seals, gaskets, rubber, all sorts of fun stuff. You will have to replace brake hoses (which cannot be checked by visual inspection), probably rebuild the brake master cylinder, clutch master and/or slave cylinder, coolant/heater hoses, replace the tires, possibly rebuild the engine, and many other parts. Do your fellow motorists a favour and don't drive the car until you are sure its safe to do so; that is, lights work and the brakes aren't going to fail! However, see the note above about non-rusty shells. A barn-find MGB with a spotless body might be worth it. The first area of the body to check is the sills, the box shaped sections that run front to back underneath the doors. Because the MGB uses a unibody or monocoque design, much of the chassis' strength is in the sills. Being box shaped, they tend to trap moisture, and rust from the inside out. Don't be afraid to get on your back under the car and poke at them with a small screwdriver. Look out for things like fresh rubberized undercoating or chrome sill plates which may have been recently added to hide rust. You can also check the door gaps, if the sills are rusted the car may be sagging and the gaps will be smaller at the top. Other common rust areas are the floorpans under the carpet, and the boot (trunk) floor. The MGB's 4 cylinder B-Series engine is a strong if not very exciting design, although the pre-1965 3-main bearing engines were a bit more fragile. All the other engines can easily last 100,000 miles or more between overhauls, and parts are inexpensive. When buying, listen for unusual noises such as a metallic rattling sound on cold idling (bearings), lumpy or high idle, check for smoke out the tailpipe, check the oil filler cap for any "brown sludge" indicating coolant leaks, and give it a good lookover. British engines are notorious for springing little oil leaks, so those may not be critical. 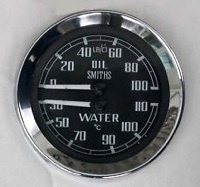 Oil pressure should be 15-25 psi at idle (~600 rpm) and 50-65 psi at 3000 rpm when warm. If you can, do a compression check to check the rings and valves, and check the spark plug electrodes for deposits (should be clean) and colour (should be tan) for correct mixture and carb problems. If this is your first MGB, it's highly recommended for you to take the prospect to your nearest British car shop (you can find many in the MG Experience Directory) and have them do a complete inspection. Very early transmissions have an unsynchronized 1st gear, so you may want a 4-sync if you plan on commuting or can't remember not to grind gears. A very desirable option is the optional Laycock overdrive, which adds a "4th and a half" gear perfect for highway cruising. Personally, I couldn't live without O/D on my MGB. Strange electrical gremlins can often be fixed by replacing the fuse box (~$10) and cleaning all the ground connections (free). If the loom has been hacked to pieces by the previous owner, complete new looms are available for reasonable cost from British Wiring and other suppliers. New MGB body shells are (were?) being produced by British Motor Heritage using the original manufacturing equipment, and if you have the money to re-shell and complete a full restoration you will end up with a beautiful as-new or better MGB - but be aware that the money you put in, if you decide to go that route, will far exceed the price you could fetch if you were to sell the car afterwards. However, as MGBs continue to appreciate in value, this might not always be the case. As with any other car, buy the best you can afford. Let the previous owner eat the cost difference between money into the car, and the money out of the car when selling. You can afford to be picky, there were half a million MGBs made, there are lots to choose from. Don't be afraid to walk away. Don't hesitate to take your prospective buy to an MG or British car garage for a 1 or 2 hour inspection if this is your first MGB purchase. The hundred bucks or so you will spend will probably be more than recovered in the money you can demand be taken off the selling price for problems the owner may not have even known was there (and save you from getting stuck with an abused or neglected car). Good luck and have a great MG Experience! Comments on "Buying Your First MGB"
Good article, I used this advice somewhat when I purchased my "B" last year. YAY! I just bought my first B - A 1976 in really good condition - for $1500. It does have a little rust along the passenger flooboard and the right rocker panel, but otherwise it is in great condition! A shiny red, 6-year old paint job, new top, new boot, new car cover, original carbs and parts in a box, new tires, and all of the gauges, lights and switches work. Not to mention that it has a brand new weber conversion and a nice AM/FM CD stereo! The downside is that the emission control equipment has been removed, but in January it isn't a required inspection anymore. I'd haveremoved it anyway so that isn't a biggie. Shopping pays off, but it doesn't hurt to be in the right place at the right time! Thanks, I am about to purchase a 1974. Found this to be most helpful to someone like myself who does not know where to begin. One thing to add to this article about rust: a small spot of rust indicates more than the eye can see, the rest of the iceberg is hidden. BEWARE! Check carefully and poke generously for thin spots. Priceless for someoe like me who has got "hooked" on the MGB, primarily on it's looks, without the least bit of knowledge. Gotta and gonna get me an MGB!! One thing to think about when buying a dismantled MG (or any other car for that matter) is completeness. On the up side, having a car already apart makes for easy inspection for rust in the usual areas. On the down side, if the car is missing anything major - seats, fuel tank, gauges, etc - it could be costly to replace and/or difficult to find. Bringing a friend who is impartial and familiar with the make and model is extremely helpful! All so very true. I would suggest the cost of towing home your purchase should also be factored in to the initial total cost. have an MGB to look at in the next few days and the info here will better arm me to judge whether it is a worthwhile project. Just bought a 1972 MGB for $2500.00. soft top. beautiful. need to bleed brakes. no rust. Such a fun car to have, just have to stay on top of it, wires like to come loose. Fantastic buy, no regrets!! This article is very well written and is a nice overview of what a person should look into when purchasing one of these gems. I don't care what anybody tries to tell you about these British sporters... they'll last forever if you are good to them! Very helpful article. Having watched "An MG is Born" several times before purchasing my first MGB, I can say that these are all things I looked at and passed on a few cars because of. then be surrounded by new friends offering good advice. Just bought my 1st mg. I am new to restoring and would like any and all positive feedback on where to start. No rust, just dirty. Has all windows/doors/no crash/and motor had not been turned on in over 6 years. I bought for $300 from neihbor. It had been sucking in rain/dust under a small open shack. I need to move,but wheels are locked. I was told to spray pb Blaster at rear wheel differantial. Is that right? I first just need to move car to start the fixups. Thanks. Bought my 3rd and 4th MGB's about a year ago. '74 1/2 RD & 74 GT. NOW I find out about rust! 3 Cracked cylinder heads so far; one blown core plug (yup, it's the rear one!). The GT had float bowls full of mud in the HIF4's. I should have been wary when the dealer said it came from Louisianna. On the positive side both cars are giving me a wealth of repair expereince I couldn't get with any other car. Can pull the engine fairly quickly now, and have rediscovered the benefits of bicycling locally, for exercise. I wouldn't part with either of them, but a sprigit might be fun too. Wow!What a great source of information for A new MGB hunter!I can't buy until I sell my boat but am still in the hunt stage.I hope to get the big Buck(MG in good shape so it won't need a ton spent on it righta way. Thanks for the great article, I found it very useful. Great Article, just bought a 77' rubber bumper, just because it has so many more features than the original 60s one. Nice piece - very well written and informative for potential buyers.